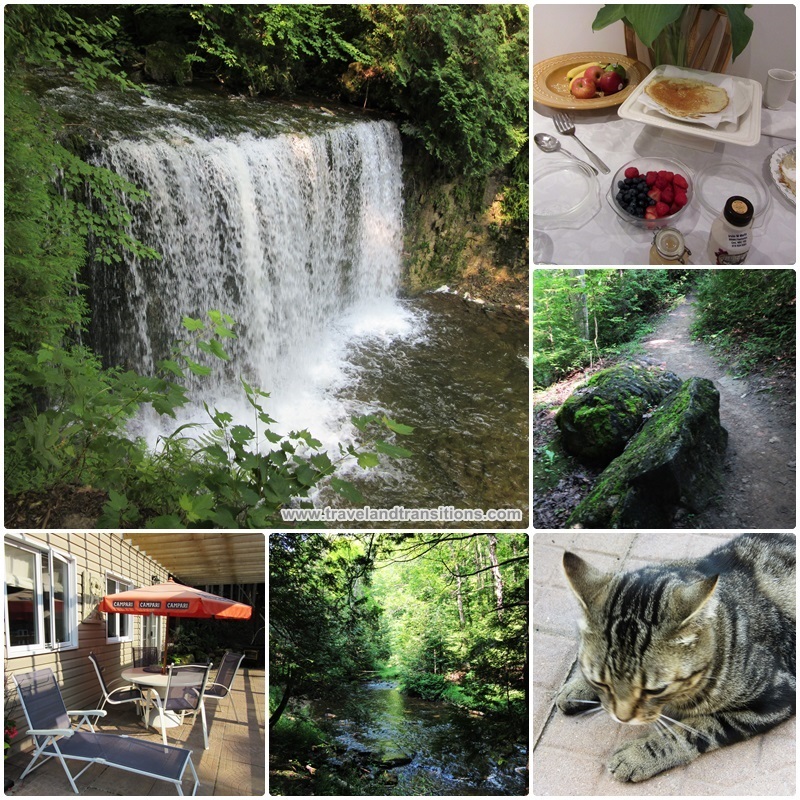 On our second day in Grey County, we enjoyed breakfast at the Guesthouse at Lake Eugenia. Our hostess Rosanne Caruso had made delicious crepes for us which we garnished with fresh fruit and whipped cream. We then had a nice chat with her about her business and the diverse travel opportunities and attractions in the surrounding region. Before our departure we also had a little bit of time to soak up the morning air on the porch which overlooks the forest right next to Eugenia Falls. It was time to say goodbye now as we were to explore other parts of this region, but we had thoroughly enjoyed our stay at the Guesthouse at Eugenia Falls and were already making tentative plans to come back in a few months when the fall colours burst onto the scene. Just ten minutes away and tucked into a wooded area off the highway, we stopped to explore one of Grey County’s best secrets: Hoggs Falls. Undeterred by a few mosquitoes, I hiked into the forest to take in the view of this waterfall, which is not the highest but definitely very picturesque. Given that the Niagara Escarpment has shaped the landscapes of Grey County, there are several stunning waterfalls to visit here: we had seen two – Eugenia Falls and Hoggs Falls, but additional cascades include Indian Falls, Inglis Falls in Owen Sound with its 18 metre cliff, Jones Falls, McGowan Falls, Weavers Creek Falls and Walter’s Falls which plunges 14 metres inside the heart of the village of Walter’s Falls and is located next to the spectacular The Falls Inn, a member of Ontario’s Finest Inns. Nature enthusiasts will fall in love with Grey County as it features the Bruce Trail, the picturesque Beaver Valley and numerous conservation areas and several provincial parks. Many people will be surprised to hear that Canada is an important wine producing country, but there are many well-established wine growing areas in this northern country, the most well known of which include the Okanagan Valley in British Columbia as well as the Niagara Peninsula, the shores of Lake Erie and Prince Edward County in Ontario. But many people are completely unaware that Ontario’s more northerly Georgian Bay region, despite its tougher climate, is an emerging wine region. To learn more about viticulture in Grey County we stopped at Georgian Hills Vineyards, founded by three local business people with Lindsay Puddicombe at the helm as the winemaker. Wine expert Vanessa McKean showed us the property and the growing areas which produce white, red and rosé wines as well as sparkling wines and dessert wines. To showcase the region’s diverse recreational offerings, Georgian Hills offers a variety of summer packages, for example the Wine & Cycling Tours, Paddle & Wine Tasting and a Wine Tasting Tour with Air 44 which includes a helicopter flight over the Pretty River and Beaver Valleys before a wine tasting, followed by a return flight over the scenic shorelines of Georgian Bay and Collingwood Harbour. In the winter, visitors to the Georgian Hills Vineyards can embark on Self-Guided Snowshoe Tours followed by a wine tasting, again a Wine Tasting Tour with Air 44, a Snowshoe Tour Adventure combined with a Wine & Cheese Tasting, as well as an Après Ski Wine & Cheese Tasting. 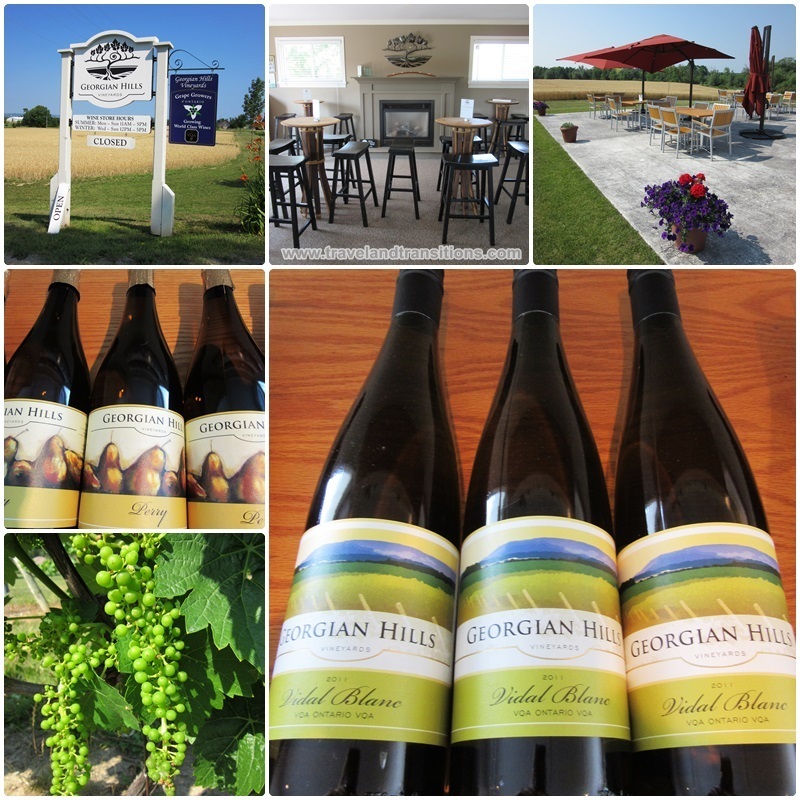 For its innovation in business, Georgian Hills Vineyards has won the Business of the Year Award from the Blue Mountain Chamber of Commerce. Georgian Hills Vineyards is part of a new emerging wine region. 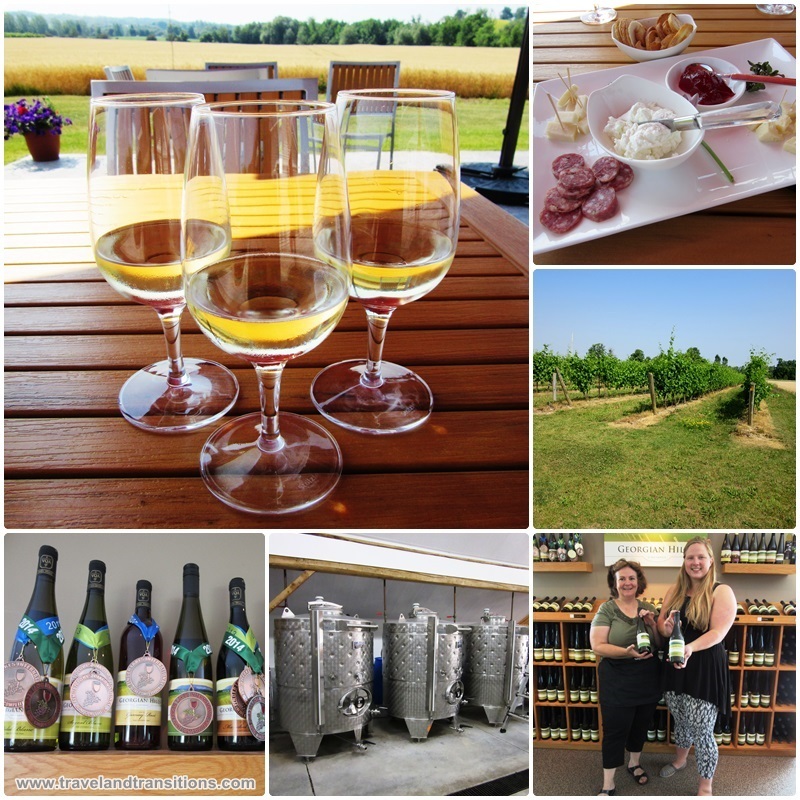 We were now getting to the real fun part of our visit to Georgian Hill Vineyards: a wine tasting on the beautiful patio, overlooking the vineyards and rolling hills of Grey County. On the menu was the Perfect Pairings Tasting, which featured a Seyval Blanc, accompanied by a C’est Bon Chevre goat cheese, a red Maréchel Foch combined with a savoury pork sausage, and the crowning touch – a Bartlett Frozen to the Core dessert wine (made from pears) paired with Ermite Cheese from Quebec. The flavours of the wines and the accompanying culinary treats went perfectly together, and the picturesque winery setting made for a nice morning outing. Georgian Hills Vineyards is a proud partner of the Apple Pie Trail, a year-round culinary trail that combines the flavoursome offerings of 37 businesses in Grey County. While exploring the Apple Pie Trail you can savour apple edibles and other locally produced delicacies and combine them with recreational activities such as bicycling, paddling, cooking and spa days, or a hike to local waterfalls followed by a wine tasting. After our wine tasting at Georgian Hills Vineyards we drove south a couple of minutes on Grey Road 2 and made a stop in a tiny hamlet called Ravenna, at the Ravenna Country Market. As one of the partners of the Apple Pie Trail, the Ravenna Country Market offers a variety of culinary treats to people in search of fresh and local food. The store is famous for its homemade soups, entrees and sandwiches, and of course for its delectable butter tarts and pies. Owner Roy Genoe showed me around the store which also carries merchandise such as locally made honey and local beef, deli and dairy products, fair trade coffees and teas as well as other groceries, souvenirs, clothing and decorative items. Outside are some picnic tables where guests can enjoy their meal in the summer sun. The store also offers catering services, beverage service and marquee & tent rentals. 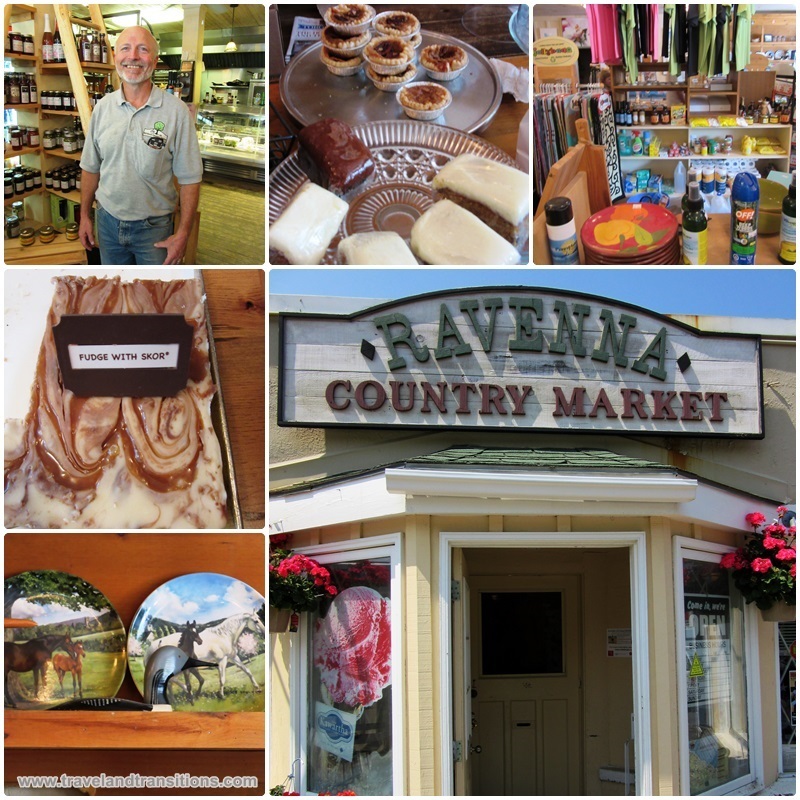 The Ravenna Country Market is renowned for its friendly atmosphere where locals congregate and travellers are welcomed. From Ravenna we drove eastwards until we reached the edge of the Niagara Escarpment where we stopped to take in a phenomenal view over Georgian Bay. To our left was the Blue Mountain Resort, Canada’s third busiest ski resorts, with 42 ski runs, 16 chairlifts and 3 freestyle terrains. To our right there was Scenic Caves Nature Adventures, a large outdoor complex that provides a variety of adventurous activities such as zip cable gliding eco tours, hiking on the Niagara Escarpment, a labyrinth of caves and craves, Southern Ontario’s longest suspension bridge, and gemstone mining. The Nordic Centre at Scenic Caves offers cross-country skiing, show shoeing, and guided night-time show shoe tours. Then we drove down the mountain into the town of Collingwood, one of the largest towns in Grey County. Historically, this was an important town due to the shipbuilding that took place here. Lightly armed WWII warships and lake freighters were built here but due to economic conditions shipbuilding came to an end in the mid 1980s. 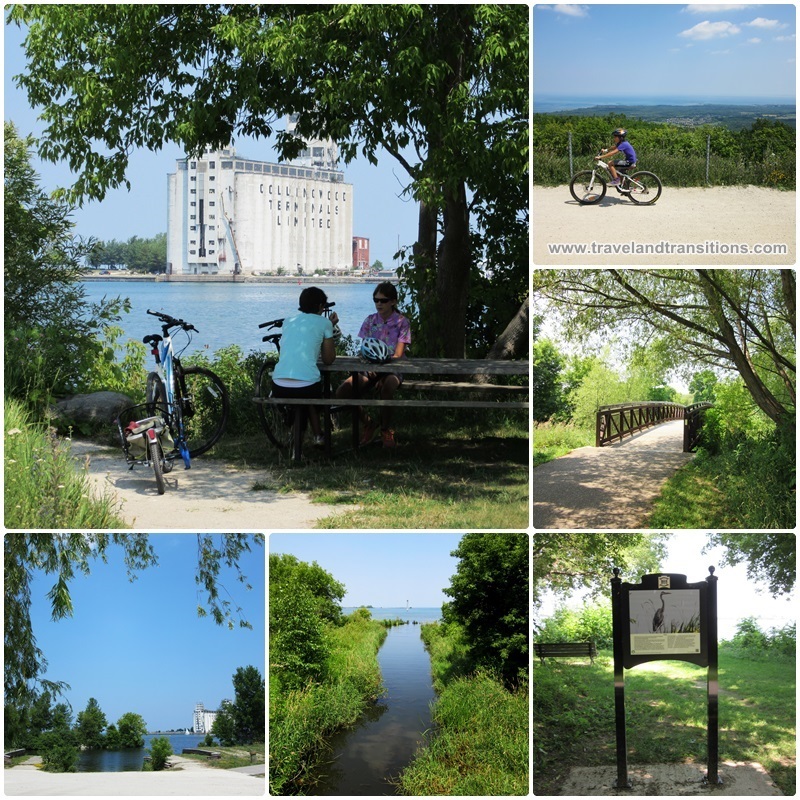 We drove through the picturesque downtown of Collingwood to the waterfront of Georgian Bay where we stopped to explore the Georgian Trail, a 32 km long recreational trail that was built along a former railway line. Much of this trail passes right along the shorelines of Georgian Bay which provides trail users with the opportunity to rest and swim during summer months. Next up was lunch at the Bruce Wine Bar in Thornbury, a pretty town just about 20 minutes away from Collingwood and located right on Georgian Bay.